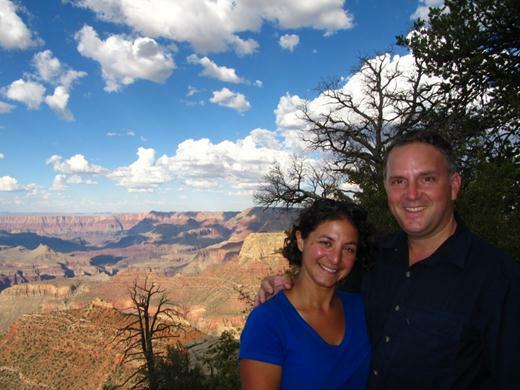 From Flagstaff, AZ we headed north towards the Grand Canyon’s South Rim – the most popular part of the Grand Canyon to visit. 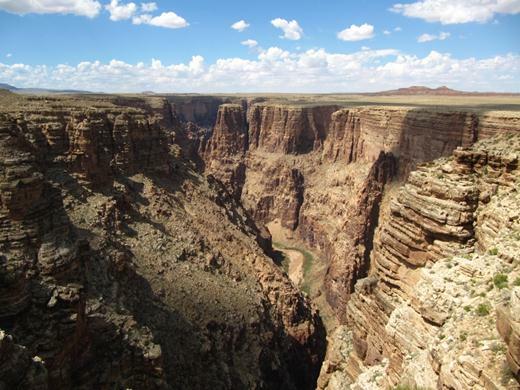 Before reaching the Grand Canyon, we took in the amazing views of the Little Colorado River Canyon. 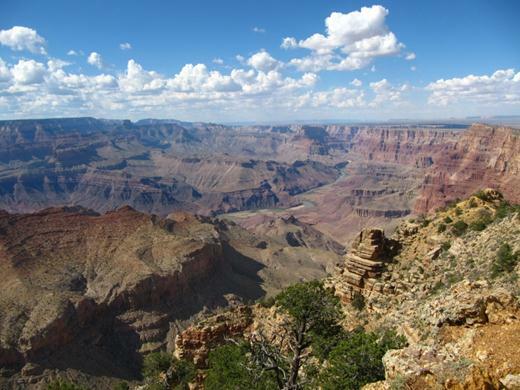 It’s so amazingly deep (2000 to 3000 feet) that your eyes can’t really process what they are seeing…and yet it’s nowhere near as deep as the Grand Canyon! 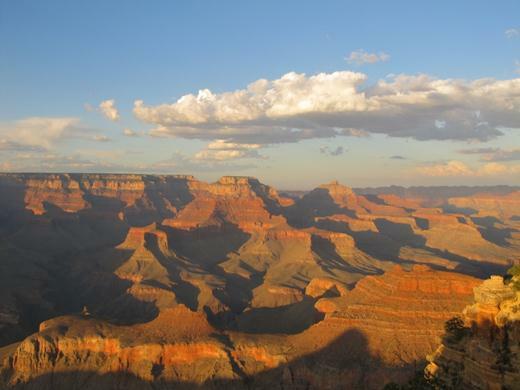 Aha – reached the Grand Canyon South Rim! This was not our first time visiting the South Rim. In fact during our 2002 North American tour we actually hiked all the way to the bottom, stayed overnight at Phantom Ranch then hiked out the next day. It is breathtaking. Pictures don’t do this place justice. 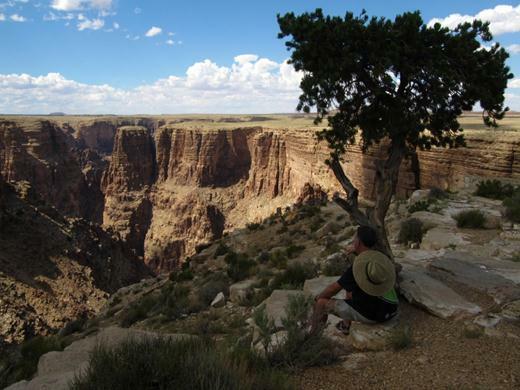 It’s just hard for a picture to capture the grandeur, the depth (the river is at least 5,000 feet below) and the majesty of the Grand Canyon. It’s not hard to see why this place draws millions of visitors each year. Shadows move as the sun goes down so the view changes constantly. 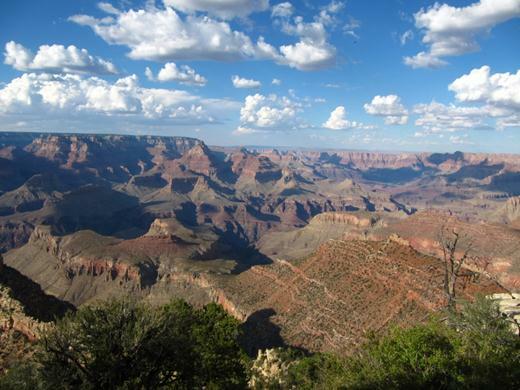 The next day we head to the Grand Canyon’s North Rim. Scenic Highway 89A is our main route. 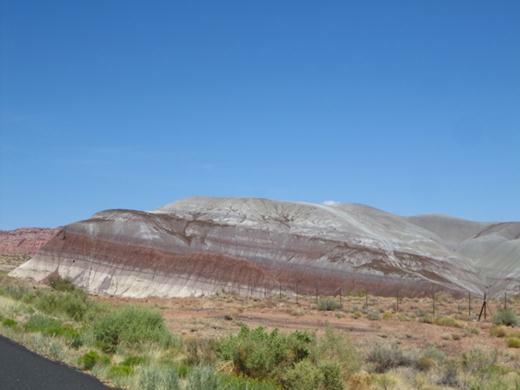 It takes us through Navajo country and some scenery that reminds us of the Painted Desert. 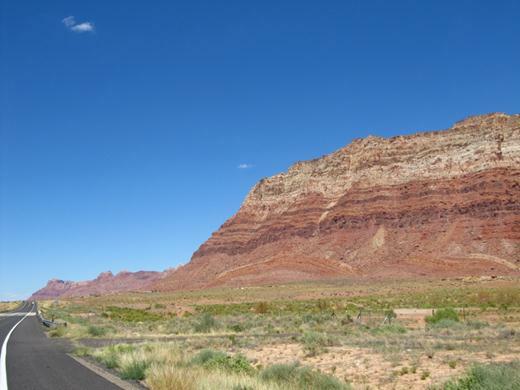 We didn’t expect much on this route as it was just a road to get us to the North Rim of the Grand Canyon…but as we continue driving along Highway 89 we see great view after great view. The southwest is true amazing at every turn. Echo Cliffs in the picture above is a good example – amazing! 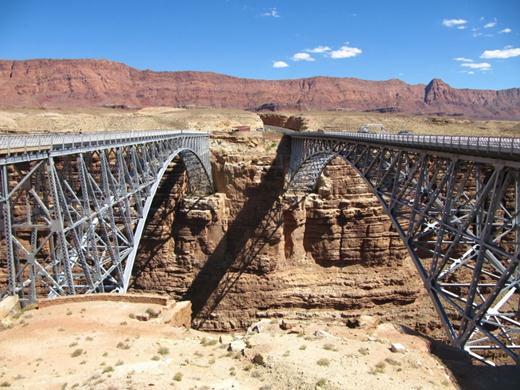 Navajo Bridge is another amazing site. It’s the only bridge for hundreds of miles. On the left is the original bridge with the one on the right replacing it decades later. 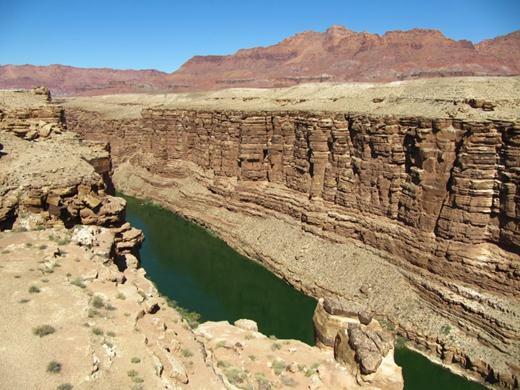 From the original bridge you can walk out over Colorado River flowing hundreds of feet below. While we enjoyed looking out over the river, nothing beats going in! 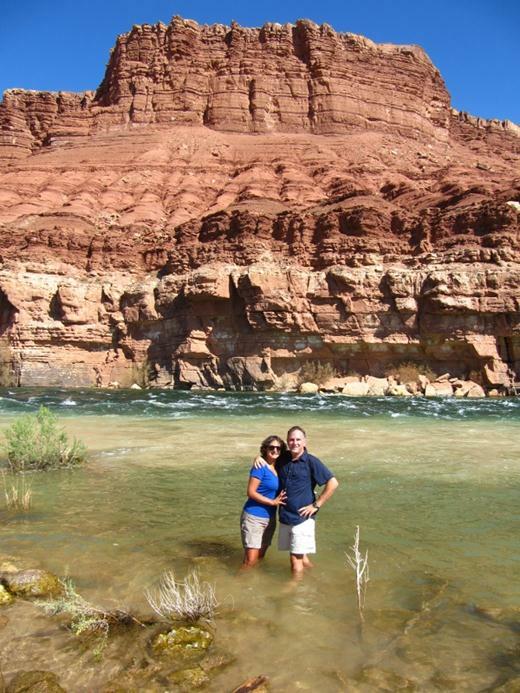 We drove down to the site of Lee’s Ferry – the very first mode of crossing the Colorado River. 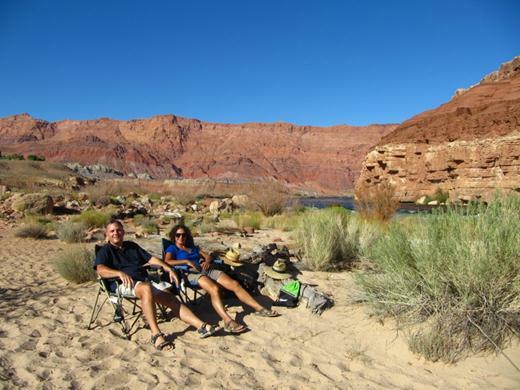 Not far from the site we found a beach and easy access to the frigid Colorado River water…just right to beat the 42C heat. Missing our Malibu beach we set up our chairs, had a “coffee”, soaked in the views…and went for a dip in the Colorado every 15 minutes just to stop from bursting into flames in the August desert heat!!! 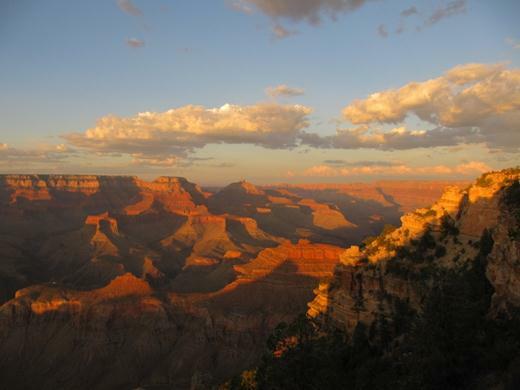 Soon we hit the road again – hoping to hit the North Rim before sun set. 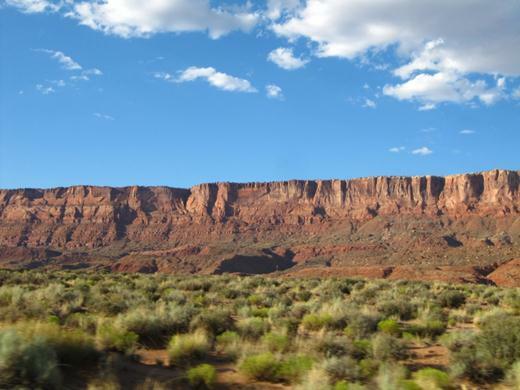 After crossing the Colorado River we drove along the Vermillion Cliffs for many, many miles. These cliffs are huge! We took this picture from a scenic overview a couple thousand feet higher than the previous picture. 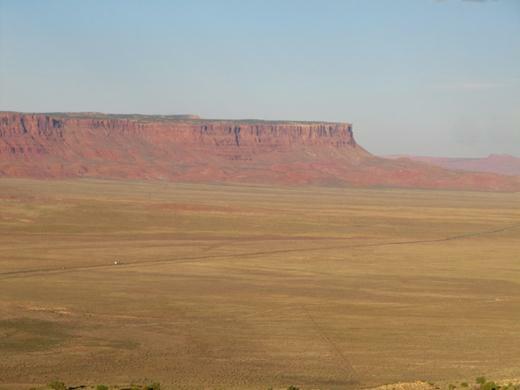 To give you a sense of size, take a look at the cliffs in the distance. Now check out the white dot on the left hand side, just below the middle. Here’s a close up. 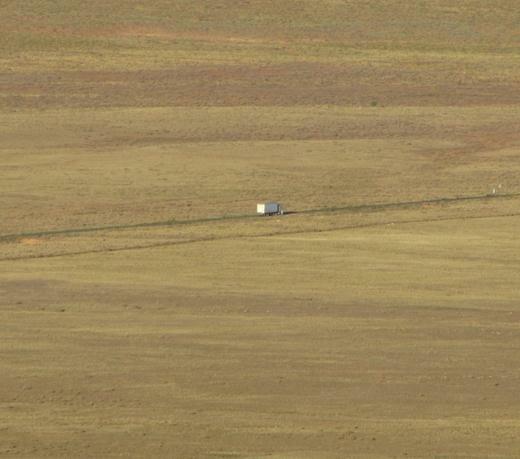 It’s a tractor-trailer. Absolutely incredible! At about 7:00 pm we finally reach Jacob’s Lake. We have at least another 1.5 hours of driving left before hitting the North Rim. On a recommendation Jason buys cookies from the Jacob’s Lake Inn. Marianna quickly takes ownership of the cookie bag! Lemon Zucchini was by far our favorite. Yup, that’s a cookie flavor and yes, it’s delicious! 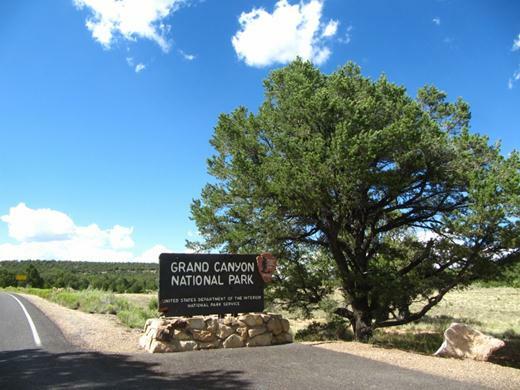 Next up, we reach the Grand Canyon North Rim! Hello, I believe your website may be possessing browser compatibility problems. When I seem at your internet site in Safari, it seems to be good but when opening in Web Explorer, it’s some overlapping. I just desired to provide you with a fast heads up! Other then that, amazing weblog! Thanks for the heads up. We’ll take a look at the compatibility issues when we return home.